Conceived originally in 1911 for faster handling of passenger train service on the Isle of Rügen, built as the class T 18 (later class 78) in its symmetrical construction with three coupled wheel sets, two trucks, large fuel and water containers and a maximum speed of 100 km/h / 62.5 mph in both directions, one of the most successful German tank locomotives. Realized in an impressive highly detailed series of the arguably most successful locomotive classes that ever ran in Germany. 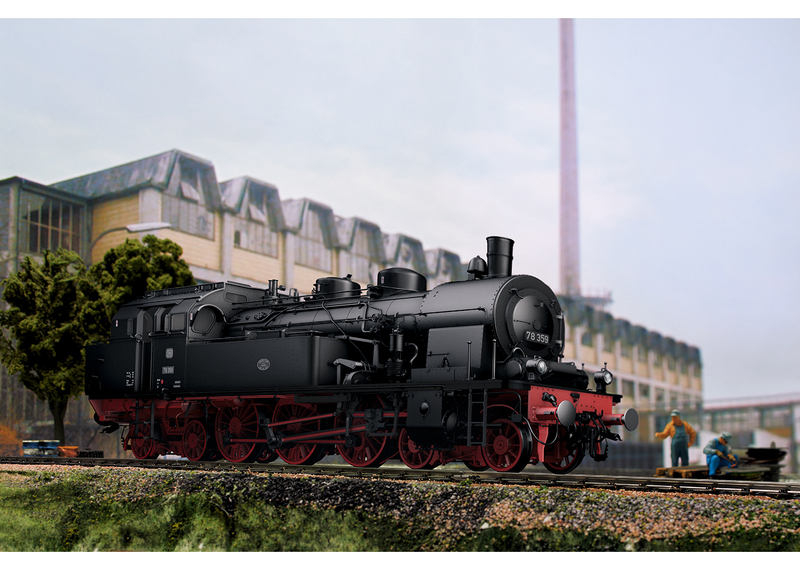 Prototype: German Federal Railroad (DB) class 78 steam tank locomotive (shuttle train version). The locomotive looks as it did around 1956. Road number 78 359. Based in Hamburg, Hamburg District. Highly detailed full metal construction. Frame, superstructure, boiler, etc. constructed of die-cast zinc. Newly developed decoder generation with a current buffer and up to 32 functions. Smoke generator with steam chuffing synchronized to the wheels, cylinder steam, and a steam whistle. Load-controlled running sounds synchronized to the wheels. Smoke box door and dome hatches can be opened, many original details included. Headlights include light color correct for the era and warm white LEDs. Red marker lights can be controlled. Firebox flickering is two colors. Running gear lights, cab lighting. mfx decoder for operation with AC power, DC power, Märklin Digital, and DCC. Valve gear switchover (forward, reverse, continuous operation) in 3 steps with a servomotor. Telex coupler on the rear, prototype coupler on the front (an extra one of each included with the locomotive). Model: The locomotive is completely new tooling. The frame and the locomotive body with boiler and cab are constructed of die-cast zinc. Other applied parts are constructed mostly of metal (brass). This is a highly detailed model with many separately applied details and a prototypically detailed cab. The locomotive has 2 boiler attachments and a smoke box door without central locking that can be opened. The water tank hatches can be opened, the cab doors can be opened, and much more. The locomotive has an mfx digital decoder with 32 possible functions, controlled high-efficiency propulsion, and a sound generator with running sounds synchronized to the wheels as well as extensive sound functions. 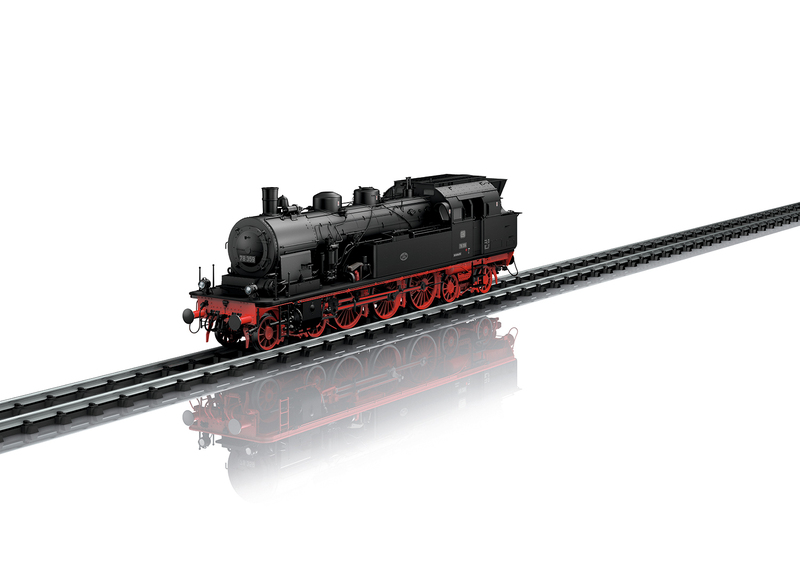 The locomotive can be operated with AC power, DC power, Märklin Digital, and DCC. The locomotive has a built-in current buffer. All driving axles powered. The locomotive has a built-in smoke generator with steam chuffing synchronized to the wheels, cylinder steam, and a steam whistle. There are dual headlights front and rear that change over with the direction of travel. The light color is correct for the era. The headlights will work in conventional operation and can be controlled digitally. Maintenance-free, warm white LEDs are used for the lighting. Red marker lights can be controlled. The locomotive has sprung buffers, and cab and firebox lighting as well as running gear lights. The locomotive comes with a prototype coupler on the front and a remote controlled Telex coupler on the rear. Both couplers can be replaced by the other type. The valve gear switchover is in 3 steps (forward, reverse, continuous operation). An accessory package with one each reproduction prototype coupler and a Telex coupler, smoke fluid, and a figure of a locomotive engineer and a fireman is included with the locomotive. The locomotive is mounted on an aluminum base painted black for display case presentation. The minimum radius for operation of the train is 1,020 mm / 40-1/8". Length over the buffers 46.2 cm / 18-3/16". Weight approximately 6.2 kilograms / 13 pounds 11 ounces. Designed originally in 1911 for faster handling of passenger train service on the Isle of Rügen, the T 18 was the result as one of the most successful German tank locomotives with its symmetrical design with three coupled wheel sets, two trucks, large fuel and water tanks, and a maximum speed of 100 km/h / 62.5 mph in both directions of travel. 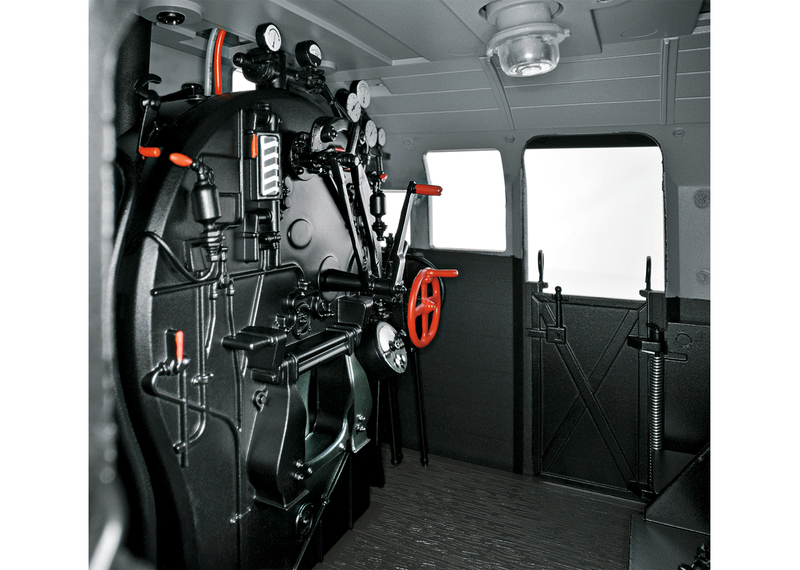 It had two-cylinder hot steam running gear with externally mounted, horizontal cylinders positioned between the wheel sets of the pilot truck. Propulsion went to the second coupled wheel set and there was a two-axle truck front and rear, each with 40 mm / 1-9/16" of side play. The T 18 had a sturdy frame. The annoying jerks still present on the prototype of 1912 at speeds of more than 60 km/h 37.5 mph were soon reduced by improved mass balancing. The T 18 was therefore authorized for 100 km/h / 62.5 mph despite its relatively small driving wheel diameter of 1,650 mm / 65". By 1927, the DRG rostered all total 460 Prussian (and clones) as well as 20 Württemberg T 18 units as road numbers 78 001-282 and 351-528. In 1935, the Saar units (78 283-328) were added. 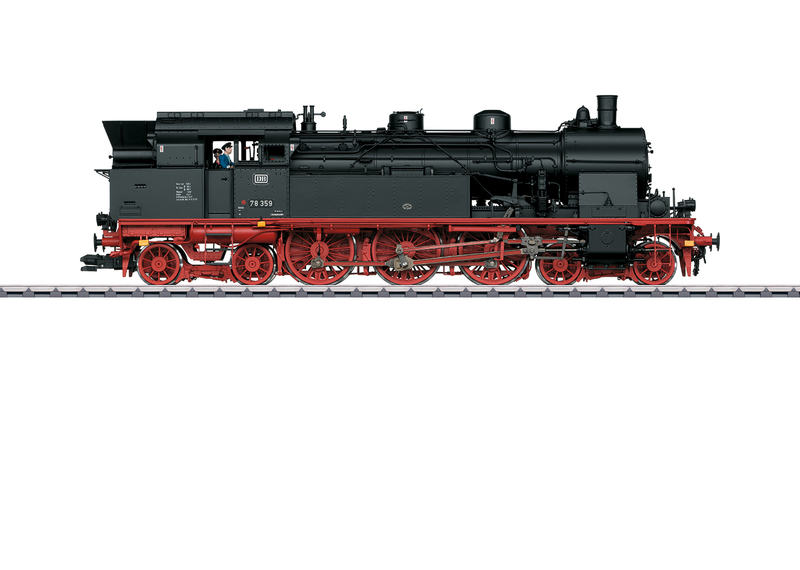 After nationalization of the Eutin-Lübeck Railroad (ELE) in 1941, the DRG acquired its T 18 units as 78 329 and 330. About 420 units survived in the Western Zones after the end of World War II. After retiring locomotives damaged in the war, the DB still rostered 377 operational units on July 1, 1950, including 32 units on the railroad in Saarland. Since for the near future these units were still needed for years, the DB decided to correct known deficiencies and retrofit better components. Equipping the units with a shuttle train control system began as early as 1951, since the class 78 units with the same maximum speed forward and reverse were ideally suited for this kind of operation. By the end of 1967, more than 120 locomotives were set up for shuttle train operation with indirect control. They were concentrated in the Hamburg, Hannover, Essen, Wuppertal, Frankfurt/Main, and Saarbrücken Districts. The last shuttle train use with class 78 units in the Hamburg area did not end until the fall of 1968. By 1968, the roster on the DB had shrunk to about 50 locomotives. Road number 78 246 at the Rottweil maintenance facility was retired as the last T 18 on December 31, 1974. It now stands at the German Steam Locomotive Museum in Neuenmarkt-Wirsberg. On the DR, the last T 18 left service in 1972. Road number 78 009 of the Dresden Transportation Museum remains as the oldest preserved T 18. Road number 78 468 is still currently operational and has served for many years as an exhibit at the Hamburg History Museum. E Dual headlights that change over with the direction of tavel.